With the popularity of streaming radio services, it could be the tendency of listening to radio shows from online radio stations. More and more such online radio programs allow users to stream and play digital audio content based on the connection to Internet network. However, you don't stay on the wireless network all the time. Then, what if you'd like to listen to online radios without purchasing the tracks? Have you ever wondered to record Internet radios for offline playback? If yes, don't miss the below top 5 most excellent Internet radio recorder software to make it possible. When it comes to online radio recorder, the first software coming up to my mind is AudFree Audio Capture. As a professional streaming audio capture, it is designed to not only record online radio from almost all radio programs, but also grab any sound from music streaming site, video sharing site, local media player, etc. with 100% original audio quality preserved. To make the offline radio tracks fully compatible with your all devices, it also allows you to convert and save recording radios as MP3, FLAC, WAV, AAC, M4A and M4B. Like it? Just download the free trail version to test its performances before buying. According to the slogan on its website, iGetting Audio can record any online streaming audio as it supports 500+ radio stations and music sites, like Spotify, YouTube, Pandora, etc. Instead of capturing online audio from your computer's sound card, iGetting Audio supports recording audio chats losslessly. To play Internet radios on almost all devices, like iOS device, Android smartphone and so on, this smart Internet radio recorder allows users to output audio files as MP3, WMA, FLAC, AAC and other common audio format. Plus, it can automatically identify ID3 tags, like title, album, year, genre. Alternatively, you can edit and customize ID3 info in the accordance with your needs. 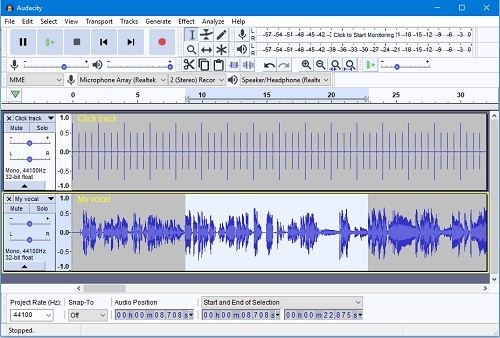 If you are just looking for the online radio recorder free, you can meet Audacity, which is a total free Internet radio recorder and editor for everyone. It both works on recording audio tracks from computer sound card and Microphone. Audacity allows you to download any sound from almost all Internet radio tracks, like Pandora, Last.fm, etc. In addition to easily grabbing online audio tracks, it is capable of saving recording audios as WAV or AIFF, editing audios, such as adding pitch, bass, treble and other great effects in accordance with your needs. Plus, this free online radio player recorder is available for series of operating systems, like Mac, Windows, Linux, etc. So, no matter you are running which OS, just download it to record radios with no cost. 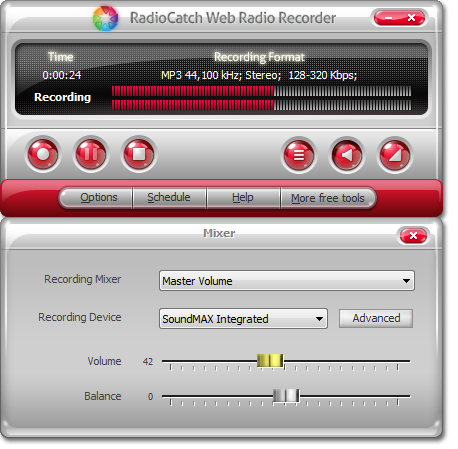 RadioCatch also names as RadioCatch Web Radio Recorder that enables you to record any audio track that you can hear from microphone, in-game sound, Internet streaming radios, local media players, like Windows Media Player, Quick Time, Real Player, etc. in high quality preserved. With the assistance of RadioCatch, you can customize the output audio quality from a low quality taking minimal disk space to high CD quality as you like. It's also an all-in-one audio converter that can save all online radios to MP3, WMA, WAV or OGG. Just search and play web radio, it will capture any playing radio and sound and then you can add effects or burn them to CD for sharing with ease. 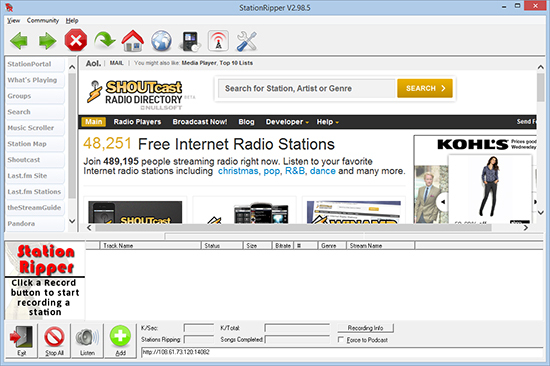 StationRipper is another Internet radio recorder freeware, which is specially designed to record radio tracks from Internet radio stations and broadcasts, such as Shoutcast audio and video streams, iTunes radio, podcast, Pandora, as well as Last.fm. But the shortcoming of this StationRipper is that it limited to record audios from 2 stations and 25 songs per session. To unlock this restriction, you're required to register its paid version, with which you can record at up to 600 song streams at one time. Don't miss the attractive news that if you register StationRipper Gold this month, you have chance to win an iPod Nano for free. Apart from the above top 5 Internet radio recorders, free or paid, there are still some other professional and excellent such online audio recorders you can select, like Screamer Radio, Freecorder, iMusic, etc. However, no matter which one you choose to record Internet radio tracks, you can listen to online radios on any device and music player offline without problem. As all of them are free to download and install with the free trial version, you can try them one by one to choose the most suitable recorder. 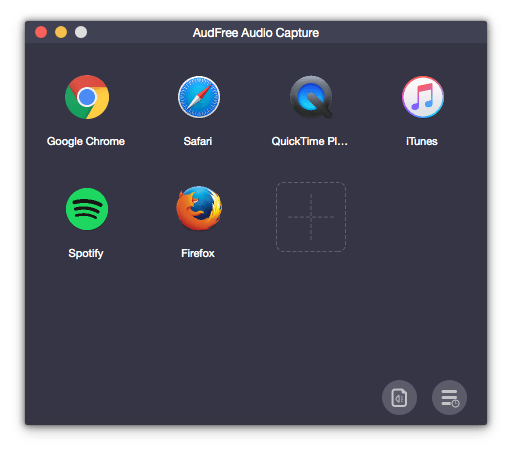 As far as I'm concerned, the best Internet audio recorder could be AudFree Audio Capture. Although it's not free, it features with more powerful functions, like capturing any Internet sound on Mac and Windows, splitting online radios individually and automatically, grab multiple audio tracks simultaneously, etc. With it, you can enjoy Internet radios offline losslessly anywhere.